Stay-at-home. 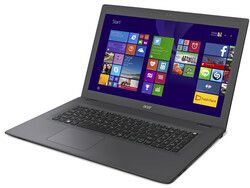 Acer's Aspire E17 E5-752G-W7TY sports one of the newest AMD CPUs from the Carrizo generation. This report discloses how the three-month-old A10-8700P scores, and whether an HD+ screen in a 17-inch device is still compelling. Acer's 17-incher features the same chassis as the previously tested Aspire E17 E5-772G-70VP with a more generous configuration (5500U. 940M, FHD), but which also costs about a third more. The keyboard and touchpad are identical, the interface diversity and distribution are identical, and the speakers are too. However, the lack of maintenance hatches is also unfortunately identical. Only the inner values have been modified. In addition to the aforementioned AMD CPU A10-8700P, an AMD Radeon M365DX for image output has also been installed. Acer's device provides a solid configuration for stationary office use. Nothing stands in the way of office work in view of 8 GB RAM, the latest AMD CPUs and GPUs, and both a decent keyboard and touchpad. The Aspire is available for approximately 650 Euros (~$737). There are plenty of rivals with specifications that differ in some details and thus there are options for everyone. 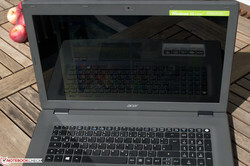 Apart from the installed hardware, Acer's Aspire is identical with the Aspire E17 E5-772G-70VP. Nothing has been modified, so please refer to our review of the identically built device for more information. We recently added the performance of the card readers in our review samples to our tests. A Toshiba Exceria Pro SDXC 64 GB UHS-II SD card is used for reference, from which image files are copied to the hard drive. Rates from 63.2 to 84.6 MB/s were reached here using the AS SSD benchmark. Large RAW files are close to these AS SSD rates, while smaller JPGs will transfer at about 52.1 MB/s in our tests. That clearly beats every USB 2.0 card reader, providing the SD card can support the faster speeds. Unlike the sister model, only an HD+ screen is installed here. 1600x900 pixels are rather scanty on 17.3 inches. It is, however, sufficient for simple office document processing. The installed screen is not particularly viewing angle stable, either. Unfortunately, the list goes on because it can ONLY reproduce 6-bits per color channel (that means that color 1 and color 2 are both present, but a multitude of intermediate color hues between both selected colors are missing in the 6-bit panel. In extreme cases, very evident borders between the colors will be seen that would not occur in a finer gradation. However, we did not ascertain such an effect in the test). 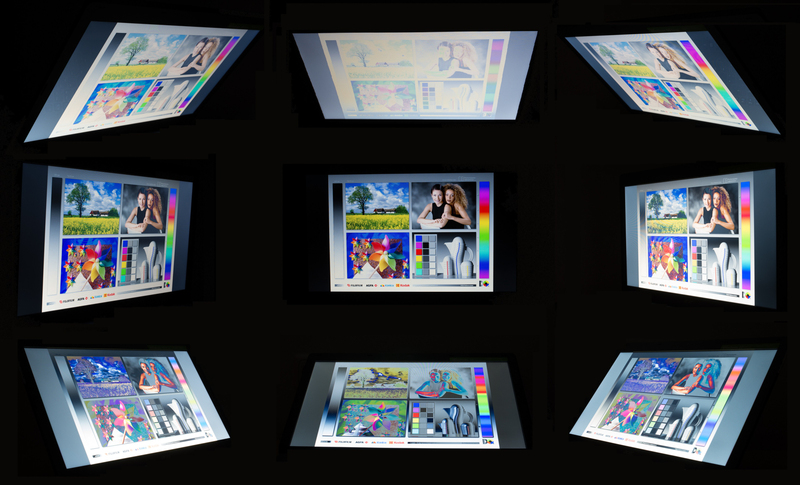 The brightness of 263 cd/m² is acceptable just like the contrast of 848:1. 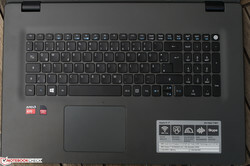 The selection of potential rivals shows a similar picture: The ThinkPad Edge E550-20DGS00300 at least has a higher Full HD resolution, but it is also smaller with 15.6 inches. 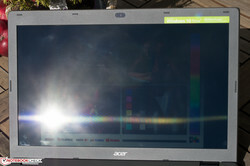 Acer's laptop should not be used outdoors. The maximum brightness is hardly high enough to prevent reflections. The screen is simply too dark even without that. Reducing the gamma level makes the contrast more tolerable. That, however, cannot belie the prominent shortcomings. 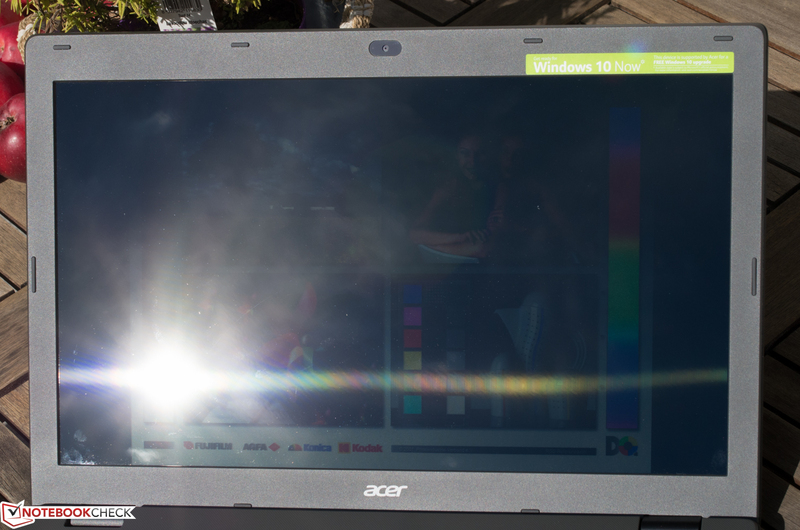 The installed HD+ screen is unfortunately the Aspire's biggest drawback. It has a very intense bluish cast, which is also reflected in the measured rates. A DeltaE of less than 3 is barely visible; a gradually intensifying color shift becomes visible beyond that. The average DeltaE rate of 11.61 falsifies the colors in our review sample (sRGB reference). The visualization of the ColorChecker screenshots clearly illustrates just how strongly the colors shift into blue. That is unfortunately also the case in the grayscale levels. They are even higher than the color's DeltaE, and also reach a shockingly high dE of 12.28. That results in a very low-contrast display in routine use, which largely spoils fun when working with it. However, this screen is not an exception in the low-cost sector. Fortunately, reducing the screen's gamma curve in the graphics driver can compensate that to an extent even without calibrating. It then looks much better subjectively. The bluish tint can also be eliminated via the downloadable ICC profile as an alternative. The Aspire E17 E5-752G-T7WY is better considered as a stationary office laptop. One of AMD's new Carrizo APUs in the form of the A10-8700P, 8 GB of dual-channel RAM, and a Radeon R8 M365DX are installed. It is therefore apt for processing documents, using Internet applications, and enjoying videos or other media. Multitasking is also managed surprisingly well. AMD's latest Carrizo processor generation is a clear step forward. Even if AMD's A10-8700P is aimed more at the Intel Core i3 processors, it is very versatile. However, it must be noted that AMD's quad-core is on the same performance level as Intel's i3 dual-cores with Hyperthreading (for example: Core i3-5005U or Core i3-5010U). The clock frequency ranges from 1.8 to 3.2 GHz. Since manufacturers can vary the TDP (12 - 35 watts), the performance of the single devices can differ greatly. This A10-8700P has a TDP of 15 watts. The CPU is however amazingly flexible when processing its tasks. Even up to 3 GHz are reached in single applications despite the performance limitation, and a stable 1.8 GHz still remain when all four cores are loaded. An unambiguous impression evolves according to the Cinebench benchmarks. The potential, 17-inch rivals are also based on AMD's hardware, but are clearly inferior to the performance of this CPU. The alternative 15-inchers based on Intel's Core i3-5xxxU score better. Intel has a clear lead in single-core performance, but AMD can catch up a bit again in multi-core performance although it cannot outrun the rivals from Intel. The latter is, however, only possible via a clearly higher energy requirement. The system performance is highly impressive. 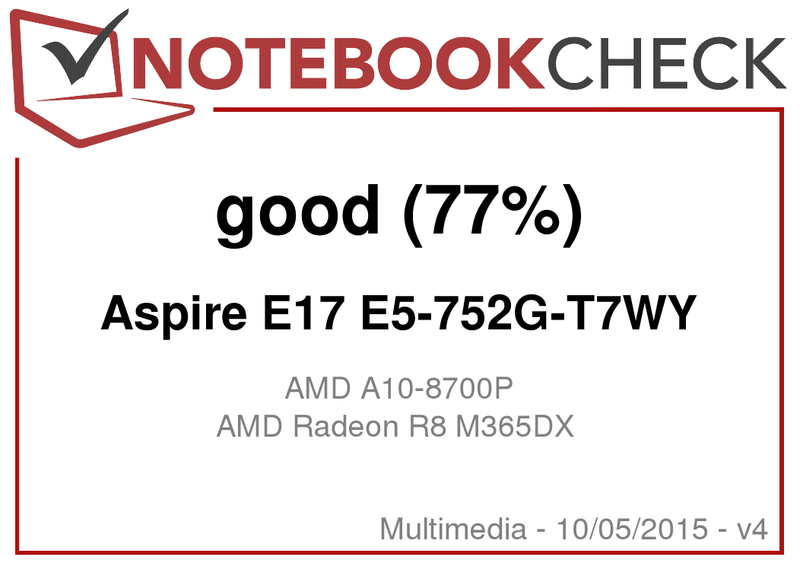 Thanks to AMD's new A10-8700P quad-core and the satisfactory hard drive, the Aspire achieves a decent 2437 points in PCMark 7. The contenders based on other AMD CPUs are clearly defeated here. Although that is still somewhat below the level of Intel's i3 dual-core processors from the Broadwell generation, a smooth workflow is very possible with this combination. Multitasking is not an issue. A conventional HDD from WD is installed. Its capacity of 1 TB is twice the size of its contenders. However, moderate transfer rates are the consequence since it only spins at 5400 rpm. An average transfer rate of 70 MB/s is rather slow. Users who want the performance of an SSD will dishearteningly discover that replacing the hard drive is not possible without effort. The Aspire lacks practical maintenance hatches, making it necessary to remove the chassis' underside completely. The installed graphics card is an oddity. 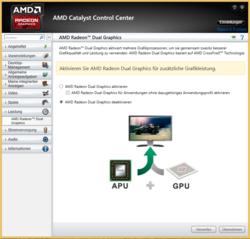 Normally two GPUs that are toggled depending on the required performance are common in laptops. The Radeon R8 M365DX is an array of the CPU's GPU (AMD Radeon R6) and the secondary GPU (AMD Radeon R7 M360). 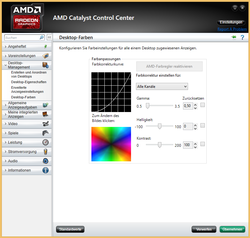 Both are interconnected via AMD's CrossFire Mode. 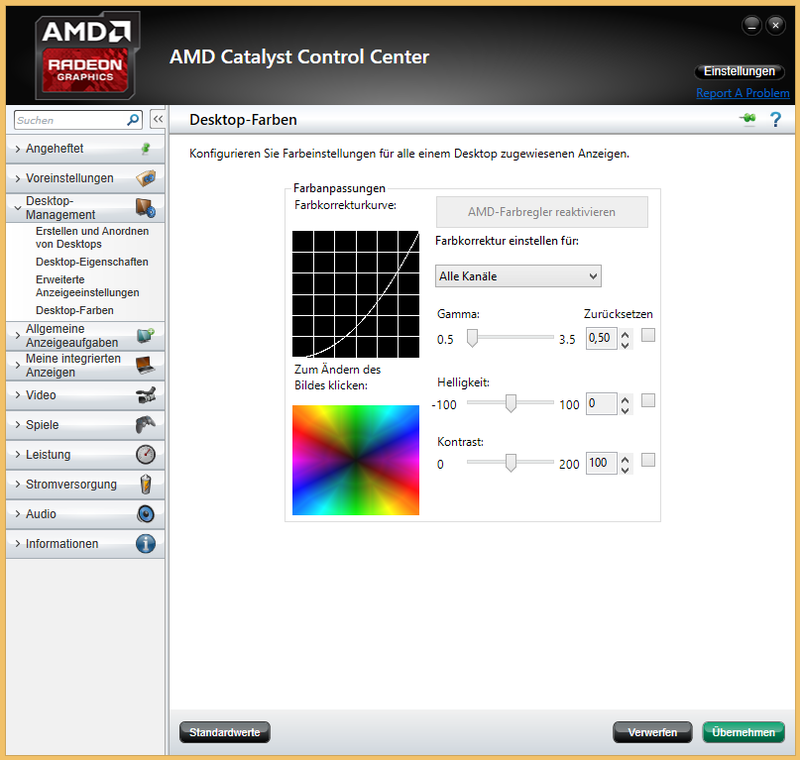 That can, however, be disabled in the driver and then only the dedicated graphics card is enabled. However, that also makes the system susceptible for micro stuttering. Whether or not the performance increases depends on the game. It can also lead to perceptible performance losses. Both graphics cards in conjunction range on roughly the level of a GeForce 920M, and are thus members of the lower midfield. The four contenders all have a much weaker graphics card; neither Intel's HD 5500 in the 15-incher nor the Radeon R3 in the 17-inchers is a match. Although smooth gameplay is possible in minimum settings, this graphics solution is only conditionally gaming suitable. Unfortunately, the resolution of 1366x768 pixels is not supported. The aforesaid micro stutters are very evident in the "Tomb Raider" benchmark. Although a smooth-looking frame rate of 64 fps is achieved in minimum settings, visible stutters can be seen. The average frame rate even climbs to 88 fps when CrossFire is disabled (in the same settings), and the micro stutters disappear. The "Tomb Raider" benchmark still manages smooth 53 fps using a resolution of 1600x900 pixels (providing that the same low settings are used as in the prior test, and only the resolution is adapted. That was also tested without CrossFire). "BioShock Infinite" can be played in a resolution of 1600x900. CrossFire presently does not really contribute to gaming fun, and thus disabling it in the driver is often recommended. The gaming performance of the rivals with integrated graphics is clearly superior even without CrossFire. The Aspire is always audible even without noteworthy load. Particularly the hard drive's noise and the fan's sporadic speed increases are noticed here. With 33.3 to 34.6 dB(A), the Aspire is still within an acceptable range. Still, the DVD drive can be distracting in quieter video scenes with its 36.3 dB(A), noticably louder than when idle. The noise clearly increases under load, and settles to just below 45 dB(A), which is very audible. The rivals behave much better here. The Aspire performed our stress test (Prime95 and FurMark run for at least one hour) in a different manner in AC and battery mode. The graphics card performance is throttled to only about 400 MHz from its core clock of 1125 MHz in battery mode, and its memory clock is limited from an initial 1000 MHz to approximately 600 MHz. The APU is not affected by that. The temperature development also presents a varying impression. Both the upper side and underside remained less than 30 °C (86 °F) and pleasantly cool without load. However, the casing heats up to almost 50 °C (122 °F) in the fan's area during load. The alternatives fare much better here. None of the four devices surpass 38 °C (100.4 °F) as a maximum rate on the underside. Although AMD's new Carrizo processor generation has made big progress in both performance and energy efficiency, the Aspire is not exactly restrained under load. It is, however, considerably more frugal when idling with 5.8 to 10.9 watts. Both other 15.6-inchers based on Intel consume less, and the 17.3-inch, AMD-based devices consume just as much if not a bit more. The consumption climbs to almost 61 watts under load (CrossFire disabled). 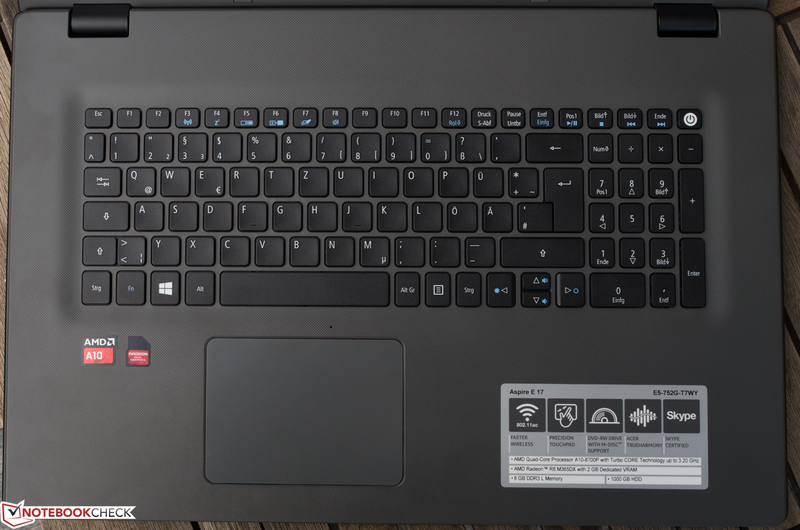 Both smaller, 15.6-inch rivals (HP ProBook 450 G2 L3Q27EA and Lenovo ThinkPad Edge E550-20DGS00) require 36 watts, and the other two 17-inchers (Toshiba Satellite C70D-C-10N and C70D-B-10X) only consume a maximum of 26 watts. The consumption is not as tragic in stationary use since it is only noticed in a louder fan and higher casing temperature. However, users who want to work on-the-move without waiving multitasking will not find this device enjoyable. The Intel Core i3 rivals outrun Acer's device by lengths. They achieve both higher performance and much better efficiency. A new website is opened every 30 seconds using a maximum brightness of 150 cd/m² in the Wi-Fi test. However, since only a 37 Wh battery is installed, the achieved Wi-Fi runtime of 3 hours and 41 minutes is only middling. The review sample is the tailend in the comparison seeing that all other models achieve at least 4 hours. To make matter worse, the power consumption also increases greatly under load, making it virtually impossible to work on battery power for long periods. Nevertheless, that is more than satisfactory for a stationary office laptop. Acer provides an affordable, stationary multimedia laptop with its Aspire E17 E5-752G-T7WY, even if it has shortcomings in some places. For example, the screen is not favorable, and the battery life could be better. On the other hand, all exterior values are compelling. The touchpad is pleasant to use, and the keyboard's agreeable typing feel even allows prolonged typing sessions. The inner values reap in additional points. Although CrossFire causes annoying micro stutters in games, the laptop's gaming performance is clearly superior to that of its rivals even when it is disabled. Although the A10-8700P is hardly a match for Intel's i3 rivals in terms of raw performance and power consumption, these disadvatanges should not bother users during daily use. It is possible to work well with the new Carrizo platform. All things considered, the Aspire is a rounded bundle. 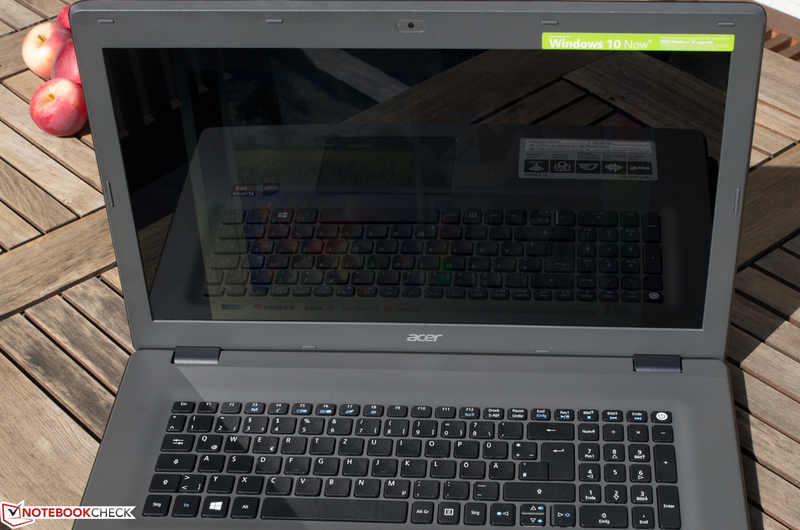 Carrizo enables smooth workflow, and Acer's keyboards are certainly a reason for purchase. The small differences of the rivals should definitely not be neglected. Users who are satisfied with HD+ on 17 inches can confidently take this device since AMD's older processors are clearly defeated, and the difference to Intel's Core i3 processor will hardly be noticed in stationary use.